Hahahaha! Reminds me of Max Corkhill and his cat Rastus that went everywhere with him on an open tank bag. I met Max and Rastus at a NZ rally and his tales of touring with Rastus when he lived in Canada and the US were amazing. 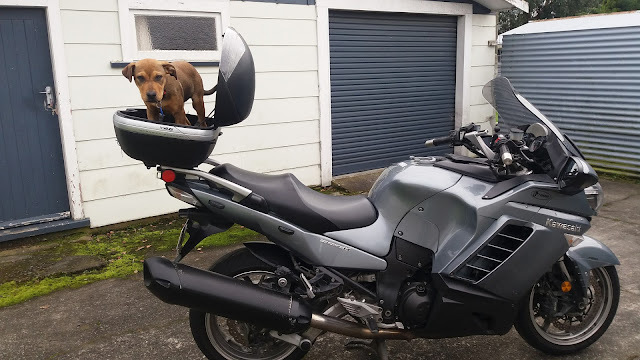 Your pooch looks less than impressed :-) , Incidentally, IAM has just had an application from a Concours rider in Tauranga. It does indeed show that they have good taste ;-). I never got the chance to meet Max and Rastus and it was a real shame when they got taken out. Your dog does not look impressed. We've seen quite a few on the back of bikes around here. One full sized husky in a crate on the back of a BMW. A hole cut out the top for his head. That is a lot of weight all up high. It would be quite cool to take her with me but I'd hate for her to fall off or something.